Arana, Joseph Patrick (Pat) of St. Charles, Mo. ; asleep in Jesus Wednesday August 22, 2018 at the age of 72, after a courageous battle with cancer. He was the loving husband and best friend to Marilyn Arana for 49 years, beloved son of the late Joseph and Pansy Arana, and devoted father of Matt Arana, and Betsy (Bruce) Nelson; cherished grandfather (Papa) of Allison Arana, Matthew Arana and Blake Nelson; special Papa to Amanda Elmore; dear brother of Gerald (Kathy) Arana and Donald (Jean) Arana; brother-in-law of Patricia Brown. Pat is also survived by his niece, nephews, cousins, other relatives and many dear friends. Pat was a retired music teacher from the Ritenour School District, where he shared his gift and love for music with thousands of children. 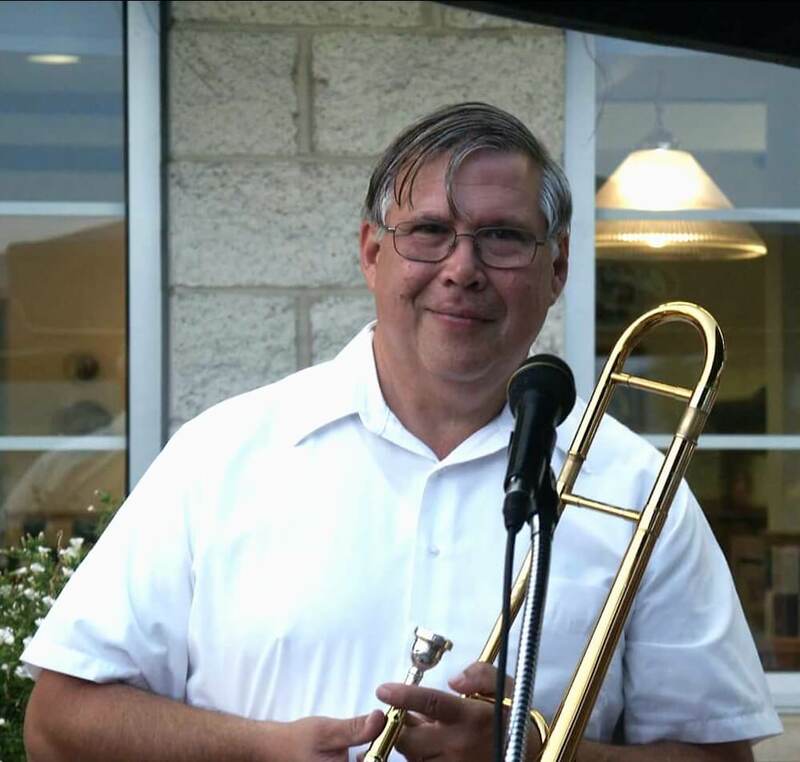 Pat was respected as one of the greatest local jazz trombonists and performed for 50 years, locally, nationally, and internationally. Today, he is playing his beautiful music in the Angel’s Band. Pat was dearly loved, and will be greatly missed by all that had the pleasure of knowing him. Services: The family is being served by the Baue Funeral and Memorial Center, 3950 West Clay Street, St. Charles, Missouri. Visitation will be held Monday August 27, 2018 from 4:00 PM-8:00 PM, and Funeral Service will be held Tuesday, August 28, 2018 at 10:00 AM, officiated by Rev. Arthur C. Repp Jr. at Baue Funeral and Memorial Center, 3950 West Clay Street, St. Charles, Missouri. Interment at St. Charles Memorial Gardens. Memorials in Pat’s name to St. Jude Children’s Research Hospital or the Stepping Stones Program in the Ritenour School District. You are playing in the Heavenly Jazz Band! God give your family strength knowing He wraps his arms of love around them all! My deepest condolences! Mr. Arana was my favorite teacher and he will be missed by many of his former students. He was an amazing, caring, motivating and inspiring teacher. He had a way of making every kid he taught love music. I couldn’t wait to go to music class every week. When I wanted to quit playing the violin he told me not to give up. Orchestra ended up being one of my favorite things and I owe that to him for believing in me. We are so sorry for your loss. Pat was a wonderful man. We remember his smile and his caring ways. He will be missed by all who knew him. Many prayers for the family! Mr. Arana is the reason I fell in love with music of all types! His pasion was shared with every child that entered his classroom door! Heaven has gained a truly beloved musical Angel. Fly high Mr. Arana! And just so you know, I can still play Christmas songs by number on the xylophone or phone, 30+ years after you taught me! Fellow Huskies. Paying my respects to a person who was good at his craft and loved to share it. Prayers for you and family. May God Bless, Protect, Comfort, . May His Grace and Mercy shine on you. Mr Arana you will forever be one of the greatest and my most favorite music teacher from learning the rounds to the scales saying Sarasponda and all the other and I love and will miss you may you leave the Angels choir and rest in peace. Pat will be so missed by us. He was the best man i ever met. What a friend. It is so true that only the good die young.i was so privileged to have him as a friend and fellow musician for many years. He was the best. There are not enough words to describe how much we loved him. God’s is with you. His arms wrap around you. He gives us strength! Marilyn and family. We are so very sorry fir your loss. Hard to even imagine. You are in our prayers. Richard and Karen Smith. We will dearly miss Pat, our friend and neighbor for over 11 years. He was a wonderful, talented and gentle man, always with a smile and friendly “Hello”. The world is lesser place without him. Our deepest sympathy to his family during this time of sadness. Mike & Dulce Wood. You’re all in my thoughts and prayers. May God grant peace upon your hearts. So many great memories of Pat & the gang starting at the Banjo Palace 50 years or so ago. Rekindled that friendship when I moved back to StL two + years ago. I’ll miss his great playing and great humor. Working with a lot of the greats, now, and my beloved Janet is watching while nursing the heavenly-eqivalent of a frosty mug! Thank you for sharing your light with us for so many years. My heart and thoughts are with you all as you celebrate his life and love. We will all miss the inspiration he gave, to so many of us “kids” through his music. I sang with you in,the St. Louis, hordinals for several years and loved hearing you talk about your Pat. You will be in my prayers! We would like to express our sorrow and condolences to the Arana family. All we have to hold onto are the happy memories that we have shared and keep Pat alive in our hearts and our minds. I was a student of mr arana from 1994 till 1999 and so many of my family members before that and after. He gave me the love of music that i will pass on to my 2 children i have shared so many stories with friends and family of his impact on my life. It truly saddens me to find out of his passing. But I am so happy that he is resting peacefully now. my whole family and i send our thoughts and prayers to his family and all of his friends. He was a wonderful teacher to all of us and a wonderful wonderful person. He will truly be missed. Deepest condolences to Marilyn, family and friends. Pat was a wonderful musician, gentleman, friend and too brought so much joy to many. Pat’s passing is our loss and heaven’s gain. He was the reason I wanted to be involved with music. He was a great teacher. He will be missed. Peace and God be with you in your time of need. It was a gift fo know and work with Pat. He and Marilyn were an amazing couple and a joy to be with. Much love and prayers to the Arana Family. I will miss my trombone partner in the Northwinds Concert Band. Pat was a great trombonist and gave me inspiration to do more. I will miss our conversations and his friendly demeanor every Tuesday evening. Marilyn & family, I am hold you all in prayer as you remember Pat. He was a kind, caring may. May he Rest In Peace. A most excellent man. Played with him many times and he always had that way of bringing out the best in everyone. We will all miss him! Very sadenned to hear of Pat’s passing. Wishing that I had stayed connected with Pat, Gerald and Donald all these many years since we all grew up together in Warrenton back in the early sixties. Our ‘Tune Twisters’ and later ‘Riptides’ band was great fun and now fond memories. You did good, Pat, maybe we’ll get the band back together up there someday. Mr. Arana inspired me to sing i wasnt famous, i don’t have a beauriful voice but he made me love it and love music i remember so many songs from music class at Marvin RIP our imspirational teacher! I was learning to play trombone at Saint Thomas Aquinas High school. I heard about a summer band program for students at Berkeley High School. I went there and met Pat’s brother. Since I was a beginner, my tone and technique was awful. The brother at Berkeley High School, gave Pat a call. Pat gave me a call, came to my house and gave me 2 free lessons. Those two lessons changed my life. I went on to get a degree in Instrumental Music and became a band teacher. I joined Northwinds Concert Band last year and did not realize that the man that changed my life was sitting three seats from me in the trombone section. I told him the story and he was very humble. So glad I was able to say thank you. What a great man!